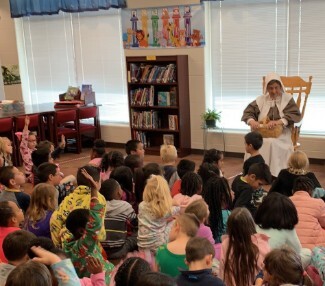 Perry's 1st grade students had a visiting storyteller, Mrs. Jeanne Hester, in the library the week before our Thanksgiving holiday. She told her story as the pilgrim "Sarah Elizabeth" and her travels to America with her family on the Mayflower and the first celebration of Thanksgiving with the Native Americans. The students were great listeners and had many good questions to ask her after the presentation.